“This series of collages, made in Lisbon throughout the year of 1977, was made out of authentic posters, arranged so as to reproduce the way they looked when they were wrenched from the city walls with this purpose. If the political poster, typical of the time, seems to be dominant, one can also find, at times, either overlapping, or separately, the circus poster, one of the most frequent in the country. This assemblage kind of work, other than its aesthetic objective, takes over and aims at assuming a facet which differentiates it from other collages and décollages that were made all around the world, for here we have an authentic historical recollection: it is a matter of fixating, through a certain form of mural writing, an entire period of the life of the city and the life of the country that is already beginning to look remote: the 25th of April. Thus, rather than reflecting on the revolutionary process, this artwork is already commenting on what came next: the 1980s. As Ruas de Lisboa can, though, be understood as an aesthetic and affective testimony of a brutal gesture of removal. Ana Hatherly uses the wordarrancar (to wrench). And in her work one can find fragments of words, images and pieces of a certain kind of aesthetics we would immediately relate to the 1974 revolutionary period. But at stake it is not so much the 1975 period itself, as its abrupt ending – and what is left for us to sense. This kind of analysis can be extended to a series of other artworks from this period, which, typically understood as synthesising an utopian impulse, are actually commenting on its abrupt ending. What lead us to think of a series of misunderstandings and paradoxes of the long 1960s and the ways in which the memory of this period has been transmitted. Isabel Brison had found a picture of the mysterious monument in a book. 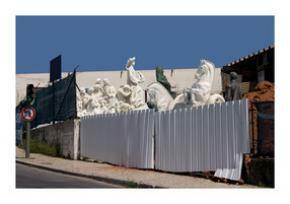 It just so happens that her partner, the artist Nuno Rodrigues de Sousa, grew up in Amadora and remembered it perfectly. He used to pass by this monument on his way to high school. 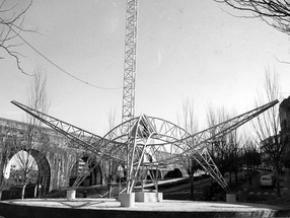 In search for the constructivist sculpture, the couple drove to Damaia roundabout. But the monument was not there: where the gigantic metallic structure once stood, all they could see were nicely ordered red and white flower beds. What had happened? 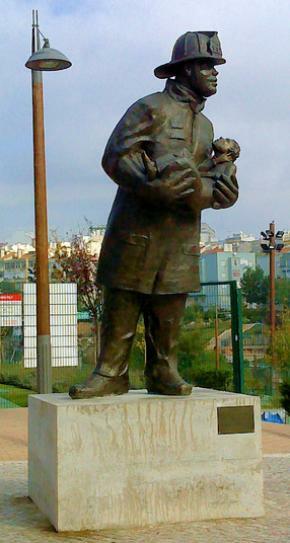 Nuno Rodrigues decided to join Brison’s research and the Águas Livres Square Monument at Damaia Roundabout project was born. Applying an historical and ethnographic method, Brison and Rodrigues de Sousa initiated a series of oral history interviews. 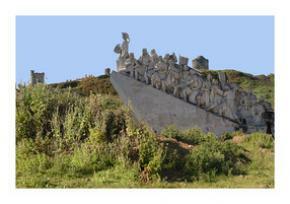 By talking to the local people, they found out that the monument was dismantled in the late nineties (around 1997) by the party that was elected to the city council at that time, ending the communist municipal tradition in Amadora. That was also how they got to know the history of the Monument to the Fireman and the playgrounds, built by the same SOREFAME unknown workers. Isabel Lucena and Marco Balesteros, graphic work for the cycle When Were the 1980s? (Lisbon April 10-21st, 2015)If the playgrounds, albeit in a renewed plastic version, happened to still be there – making us ponder the fact that at least the unknown workers succeeded in keeping the land for community purposes, the monument to the fireman had been removed from its central position on the main square and taken to a garden nearby (fig 5). In its place now stands a discrete iron statue of a fireman (fig 6). There was no clue, whatsoever as to where the Rotunda das Águas Livres monument could be. It had been dismantled. In 2008, while I was researching on theatre, dance and performance art history in Portugal from the perspective of international exchanges and global aesthetic influences and contaminations, the ACARTE Department that had been closed down in 2002, stood as a fundamental reference. And yet it was almost unstudied and barely visible, present only indirectly embodied in the performing art repertoire, namely in the Portuguese New Dance scene, or in people’s memories. Nuno Rodrigues de Sousa. Courtesy the artist.The Department had not only hosted foundational artists from all over the world (with a focus on Europe, since the country was joining the EEC), but it had produced and presented hundreds of events in fields as different as dance, performance art, theatre, cartoon, literature, jazz, experimental and world music. It was one of the first institutions in the country to deal with multicultural issues. All this was occuring in the 1980s, at a time when Portuguese society faced major changes – such as the gradual ‘inclusion’ of half a million people coming from Angola, Mozambique, Cape Verde and Guinea-Bissau (after 1975); or the European Community membership (in 1986). A close look at the almost untouched archives disclosed a scenario in which the ACARTE Department, especially in the first years when brand new and working through ‘curadoria da falta’, was the place for activities that could not be hosted anywhere else, among them a series of radical experiments in performance and performing arts, but also a series of initiatives concerning African countries for which a new kind of approach was needed. If often the discursive terms in which this approach was set were anything but radical, the ways in which the audience enthusiastically and polemically reacted to the Sun Ra Arkestra (USA), Sossabe and Os Tubarões (Cape Verde) points to the need to look at institutions (and to ACARTE in particular) as something that is practiced… to see in them emancipatory potentials that often go beyond their institutional discursive frame, allowing us to think of its common uses and how they (in)form the construction of subjectivities. Though extinct, ACARTE was an absent presence. 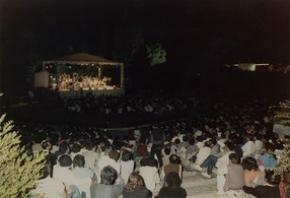 Soon this also happened to the Ballet Gulbenkian after forty years of existence, as it was extinct in 2005. And who knows, it might even end up happening to state funding for the culture as the Ministry of Culture was also extinguished in 2011, now replaced by a Secretary of State, directly dependent on the Prime Minister’s office. As what it is aims at standingfor what it was and for what could therefore be - archival and repertoire work seem the all more urgent. Nuno Rodrigues de Sousa. Courtesy the artist. Calouste Gulbenkian Foundation archive.Finally: DEVOLUÇÃO / RESTITUTION, the third operation, resulting from an effort to deal with the two operations mentioned before, while doing it collectively, in the public sphere. For now I will change the order of the presentation a little bit and start by presenting an excerpt of Isabel Brison and Nuno Rodrigues de Sousa’s work on Águas Livres SquareMonument at Damaia Roundabout. 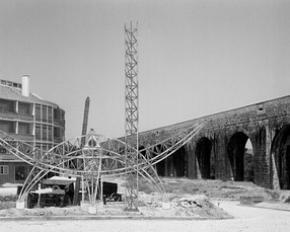 After an extensive investigation (materialised in a zine and a series of images) on the free work made by unknown SOREFAME workers, Brison and Rodrigues de Sousa risked the conclusion that most probably the monuments would not have been removed if they had been made by well-known artists and considered ‘proper art’. But alongside their ‘real’ investigation, they started to develop their own interpretation of the facts: due to the constructivist form of the monument, they related it to productivism, one of the dominant factions inside Proletcult, in which art was to join industrial production. Inspired by Alexander Bodganov’s 1908 novel Red Star and the 1927 Russian film Aelita, in which a utopian society is founded on Mars – the Red Planet, they depicted the Águas Livres Square Monument as a spaceship travelling to Mars. 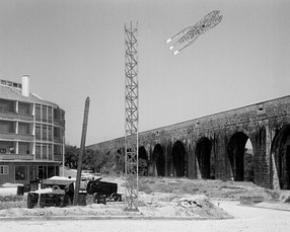 By doing so Brison and Rodrigues de Sousa were not only commenting on the monument’s disappearance but also relating it to the withdrawal of an utopian impulse – the ‘end of history’ as preconised in the 1980s – which, far from being gone, is ironically pictured as active elsewhere, in this case, on Mars. Isabel Brison and Nuno Rodrigues de Sousa 'O Monumento da Rotunda das Águas Livres'. Isabel Brison and Nuno Rodrigues de Sousa 'O Monumento da Rotunda das Águas Livres'. Animation studies (work in progress). Isabel Brison and Nuno Rodrigues de Sousa. 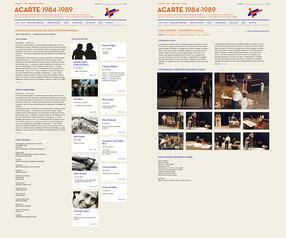 The ACARTE Timeline 1984-1989 I worked on proposes a digital interface to ACARTE’s action in the 1980s. It functions as a radical archive that can be understood as a commons tool, essential in the transmission of the repertoire of time-based art, such as theatre, dance and performance art, among others. It can also be useful to address the 1980s Portuguese culture or the European performing arts of the period, specially the newly born New Dance scene. But most of all, it can be used as a tool to inquire how the modern art museum was collectively used at a particular moment in time – enabling to illuminate the ways in which institutions become common institutions 2, where Gulbenkian Foundation is obviously seen as ‘ours’: commons. [See “Que Gulbenkian temos? Que Gulbenkian queremos?” in Expresso, Lisboa, 8 de Março de 1975.] Such a tool, while used, might allow for various appropriations, disclosing the past and contributing to a more accurate understanding of the present as well as opening up possibilities for the future. Finally, Hatherly’s As Ruas de Lisboa can be seen as one of the influences for Marco Balesteros and Isabel Lucena’s brilliant graphic proposition for When Were the 1980s? Working with an array of recent images found by the curatorial team of the cycle, Balesteros and Lucena succeeded in creating a sensorial approach to the core question of the cycle, while simultaneously giving an account of the brutal gesture of removal mentioned earlier. Each poster would therefore work as a repository of recent visual culture, familiar and unfamiliar, deep and superficial at the same time, made out of pasted fragments over an unlimited surface. By detailing these examples, I wanted to shed some light on the reasons that led us to address the 1980s as a question. Namely, the ways in which the present is marked by the brutal presence of gestures of removal; how the mapping out of those gestures reveals eccentric chronologies; and how we have acknowledged this by undertaking an operation of restitution/ devolução, in which we can include the very curating of the cycle When Were the 1980s? Screenshots of the ACARTE. 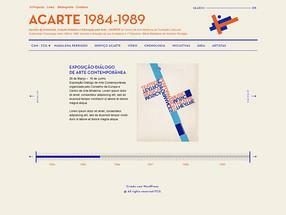 Timeline 1984-1989, project by Ana Bigotte Vieira. Not only When Were the 1980s? 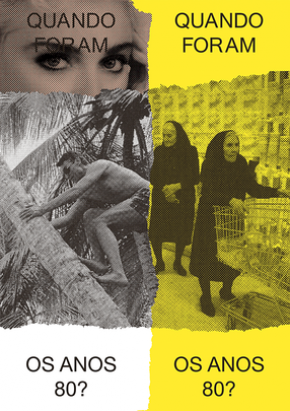 could be seen as one of the very first efforts to critically scrutinize the Portuguese 1980s, but also the ways in which that was being done were quite open. Such an approach involves both the opening of cultural phenomena to its relations with politics, society and economy, and the inclusion of historical phenomena transcending the 1980s, either with their origins in the post-revolutionary period, or beyond into the 1990s. With the backdrop of a non-linear chronology, When Were the 1980s? proposed, thus, ameeting structured in open call, along with a set of activities where a critical and sensory revisiting of a series of spaces, practices, images and products ‘of the time’ took place: music sessions with live comment, TV marathon, walks around pivotal 80s places, cinema and debate. In the ways this cycle went about there was an effort to both map out critical non-nostalgic researches being currently done, and to collectively investigate the foundations of our current moment. By watching 1980s TV together or listening to 1980s music collectively there was an urge to enact the powerful social experience these kinds of media endorse and to collaboratively investigate their sound, images, historical context and emotional resonance, while at the same time having fun. 3 But to conclude, let us return to Back to the Future I. Right before the film ends, Doc states: “ROADS? Where we’re going we don’t need ROADS”, opening the plot to the next episode, where McFly travels to 2015. Well, here we are, in 2015. POST SCRIPTUM - I am editing this essay at the beginning of September 2015, five months after I first wrote it. Europe is said to be currently facing the biggest refugee crisis since the Second World War. In the media, images of people escaping from their home countries devastated by war and misery and arriving to Europe are recurrent. 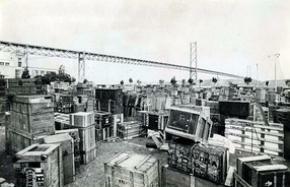 As these pictures spread and instigate different reactions – some of them highly racist and xenophobic – another picture came to my mind: a picture of Lisbon in 1975 by Alfredo Cunha, shortly after the arrival of 6000 people from the Portuguese ex-colonies of Angola, Mozambique, Guinea-Bissau, São Tomé and Príncipe and Cape Verde. 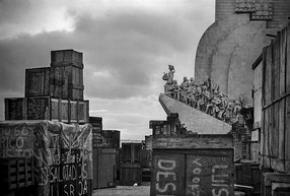 foto de Alfredo Cunha, 1975.The regime monument to the ‘Discoveries’ - Padrão dos Descobrimentos[fn]Initially built by architect Cotinelli Telmo in 1939 for the Portuguese World Fair of 1940 as a temporary construction, Padrão dos Descobrimentos was re-built in as a permanent Monument to the Discoveries for ‘Comemorações Henriquinas’, a series of commemorations of the Discoveries that took place in 1960 immediately before the beginning of the Colonial Wars. - on which more than two dozen heroic male ‘discoverers’ face the ocean in epic fashion is surrounded by wooden boxes full of the belongings of people who had recently ‘returned’, this image ironically captures the post-colonial moment Lisbon was facing in 1975. And yet, while I grew up there in the 1980s and 90s, the recent coming of all these people from Portuguese ex-colonies was almost invisible - similarly the colonial wars were almost never mentioned, in what can be seen as one of the biggest REMOVAL operations of the recent Portuguese past. o Dia a Dia de Lisboa no caldeirão do PREC', jornal Observador.In fact, not only were these issues not being addressed, the Portuguese ‘Discoveries’, crucial to the dictatorship’s self-image, were invested with new rhetoric in the 1980s and 1990s as the country negotiated its position in the European Community. Dressed as ‘globalisation pioneer momentum’ and celebrated again and again in initiatives such as the creation of the National Commission for the Commemoration of the Portuguese Discoveries, in 1986, or the Expo 98, in 1998, there was never a moment to address the massive arrival of these people, nor to discuss the traumatic experience of the wars, all barely visible for my generation. Kiluanji Kia Henda, 2007The artists Kiluanji Kia Henda and Isabel Brison have individually taken the iconic Padrão dos Descobrimentos as working material in a gesture that echoes what was previously named DEVOLUÇÃO/RESTITUTION. Although very different, their artworks have in common a sense of irony and joy that are crucial to deal with the centuries of violence implied by colonialism. 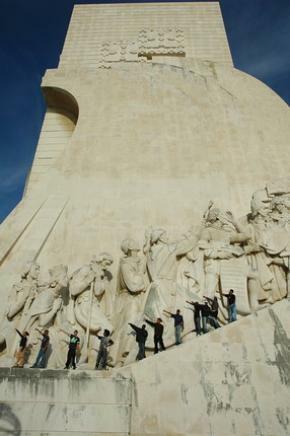 Kia Henda invites a group of young black men from the Lisbon outskirts to the monument, affectively bringing into presence the very effects of the ‘Discoveries’ and humorously compelling people to address them, rather than commemorating violent colonial pasts. Isabel Brison attempts to remove this statue, which remains until now a symbol of the country, regardless of its correspondence with the imperial colonial image forged by the dictatorship. In a succession of Photoshop coups, Brison enacts an operation that is said to have been part of the revolutionary process agenda in 1975. There is an urge to deal with the perception of the colonial legacy, starting by the removal of its ‘imperial’ presence by concretely thinking what to do with its symbols. In the first work, she removes the statue from its position by the water, transferring it to a hill where these figures, looking anything but glamorous, get literally stuck; in the second one, Brison goes further and dismantles the heroic composition depositing them in a storage. With no pedestal and taken individually as pure materiality – stuff to store – these figures look semi-lost. All crowded and cluttered, lacking decent conditions, their image made me think of them not as heroes but as ordinary people (migrants who went overseas? refugees? prisoners?) – or better, as statues of people, representation. Thinking about what is going on now and the images that have been circulating in the media, I long for actions similar to Brison’s and Henda’s: something powerful enough to dismantle the hydraulic rhetoric of ‘flux’ and ‘floods’, allowing us to address people arriving as people, whether they are refugees or migrants. Bennett, T. 1995. The Birth of the Museum, Routledge, London. Bennett, T. 1996. “The Exhibitionary Complex” in R. Greenberg, B.W. Ferguson, S. Nairne (eds. ), Thinking about Exhibitions, Routledge, London, pp. 81-112. Benjamin, W. 1940, On The Concept of History, Translated into English by Dennis Redmond, viewed 17 September 2015. Borges, J. 1945, The Aleph. Translation by Norman Thomas Di Giovanni in collaboration with the author, viewed 17 September 2015. Foucault, M. 1967, “Of Other Spaces: Utopias and Heterotopias”, inArchitecture/ Mouvement/ Continuité, October, 1984. Translated from the French by Jay Miskowiec, viewed 17 September 2015. Jameson, F. 1984, “Periodizing the Sixties”, Social Text, No. 9/10, Spring-Summer. 1. In CASTELO BRANCO, Edwar de Alencar. PO-EX: a poética como acontecimento sob a noite que o fascismo salazarista impôs a Portugal. Rev. Bras. Hist. (online). 2014, vol.34, n.67, pp. 131-155 (my italics), viewed 5 September 2015. It is curious to notice that this series of paintings in 1978 were titled Descolagens da cidade. Escrita mural de Ana Hatherly. Exposição Portuguese Art Since 1910. Londres, Royal Academy of Arts, 1978. When and why has the series changed name still needs to be studied. 3. In this sense, a proposal such at the TV Marathon organized during the cycle When Were the 1980s? has a parallel in events such as Collective Listening, Collective Liberation at Interference Archive in NYC, even though there is no direct relation between the two events. Ana has a PhD in Communication Science/ Contemporary Culture - Communication and Arts from Universidade NOVA of Lisbon. Her PhD research, recently awarded with an Honorable Mention in Contemporary History by Mário Soares Foundation centers on the ‘cultural transformation’ that occurred in Portugal after it joined the European Union in the 1980s, focusing on the performative role played by the opening of the Modern Art Museum. Vieira was a Visiting Scholar at Tisch/NYU Performance Studies from 2009 to 2012. She graduated in Modern and Contemporary History at ISCTE, and undertook post-graduate studies in Contemporary Culture at Universidade NOVA de Lisboa and in Theatre Studies at Universidade de Lisboa. She works as a theatre and dance dramaturge. 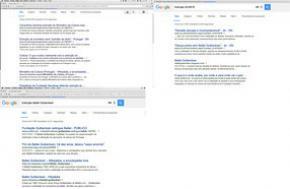 She is a researcher atIFILNOVA and IHC (Universidade NOVA de Lisboa), and CET (Universidade de Lisboa). Vieira received a Dwight Conquergood Free Registration Award at PSi # 17, in Utrecht and was co-curator of Generative Indirections | PSi Regional Research Cluster in Portugal. Founding member of baldio | performance studies research collective and Jeux Sans Frontières/BUALA editorial platform. Her writings have been published in Le Monde Diplomatique, L’internationaleonline, Punkto Magazine, BUALA, idança, among others. She has been curating small-scale discursive and performative events around Arts and Politics together with Sandra Lang and is currently working together with choreographer João dos Santos Martins on project of collective historicization of Portuguese New Dance. Ana Bigotte Vieira has translated, among others, Giorgio Agamben, Maurizio Lazzarato, Luigi Pirandello, Mark Ravenhill, Annibale Ruccello and Spiro Scimone. Together with Luis Trindade and Giulia Bonalli, she was co-curator of the cycle When Were the 1980s? IHC, Lisbon.